Sri Ramakrishna, the God-intoxicated, God-realized being of nineteenth century India, was born in 1836 of poor but pious parents in a small village in Bengal. Entering mahasamadhi (final absorption into Absolute Reality) in 1886, He nevertheless exercised a profound spiritual influence on the peoples of the world over this fifty-year period. That influence remains and continues today, becoming more and more pronounced as the effects of his God-centered life manifest in our contemporary human culture. 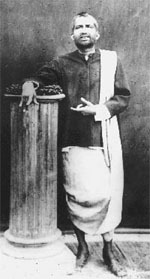 Born on earth together with his consecrated wife and spiritual consort, Sri Sarada Devi, known lovingly as the Holy Mother, these two divinities of the Kali Yuga (the present age) closely resemble other divine couples of the past such as Sita and Rama of the Treta Yuga and Radha and Krishna of the Dvapara Yuga. Behold, Sita's beloved has returned again. The One whose knowledge remains ever-perfect and whose selfless love embraces even the outcast shunned by society. Throughout the three worlds there is no equal to this incomparable One, for He is the Supreme Being whose presence alone saves and benefits the world. The nectar that has been obtained by churning the infinite ocean of the Vedas, into which Brahma, Vishnu, Shiva and other gods have poured their strength, which is charged with the life-essence of the Avatars--Gods incarnate on earth, Sri Ramakrishna holds that nectar in His person, in its fullest measure. Recognized by many as the Avatar of the the Kali Yuga, a complete Divine Incarnation, Sri Ramakrishna was an ecstatic holy man, illumined sage, incomparable spiritual teacher, perfected yogi, loving husband, selfless servant of humanity and consummate devotee of the Mother of the Universe all in one. Even these praises cannot adequately describe Him. In addition, His powerful influence served to stem the tide of western materialism that threatened to deluge Mother India just prior to His advent on earth. This feat saved and revived the timeless and indescribably precious spiritual teachings of India, a wealth of the most profound and ancient scriptural wisdom known to mankind's history, formulated over many centuries by an illumined, God-centered race. Filled with divine power yet egoless and humble, of unsurpassed knowledge yet unschooled and unlettered, a lifetime celibate yet married with an extended family of mind-born children, this enigmatic and mystical figure was nonetheless down to earth and practical. Simple and unostentatious, devoid of material wealth, possessed of an encyclopedic knowledge of the ancient scriptures and an uncanny ability to fathom the depths of the human mind, Sri Ramakrishna was known as the "King of the Devotees" due to His natural and inherent faith in God. He realized God as the formless Reality called Brahman, and worshiped the same as God with form, called Shakti and this is also one of His gifts to humanity. By affirming that Divine Reality is both formless and imbued with form, He put to death the age-old doubts surrounding this and other philosophical quandaries. Besides experiencing the various types of samadhi (subtle states of divine union) listed in the sacred scriptures of India, Sri Ramakrishna, known as the "Great Master", entered spiritual states that were both unknown and unrecorded in the history of religion. His unique and comprehensive way of expressing Truth attracted aspirants and illumined beings alike. Praises from thousands of devotees who have committed their lives to the ideal He exemplifies, as well as salutations and respects from various notables such as Swami Vivekananda, Swami Brahmananda, Mahatma Gandhi, Sri Aurobindo, Romain Rolland and many others in both secular and spiritual fields, reveal Him to be one of those extremely rare beings who visit the earth in times of crisis with a transformative message of Truth. Such a being provides both solace for those who suffer and timely solutions for the ills of relative existence. but beings ever fail to recognize Me. These lives of Mine are mere appearance, Arjuna. Being of imperishable origin, I create perishable nature and enter into all things. I establish on earth the true path to Brahman. It is for these reasons that I assume a body. when they leave this earth, they gain My realm and return no more.